« BassBuds: Great Sound, but where’s the volume control? 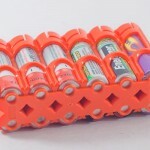 The Powerpax Storacell battery caddy has quickly become my favorite way to store and organize my batteries for electronic flash and other electronic photography items. 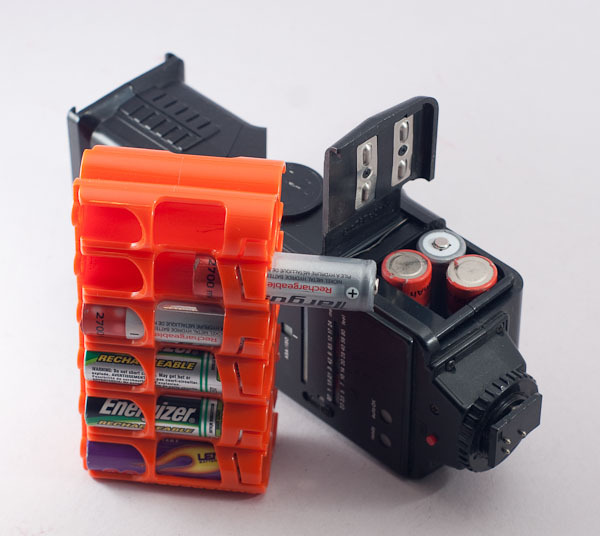 I have recently started using PowerPax Storacell battery caddies, and I really like them for camera bag battery storage. A couple of years ago, I posted about the nylon cases that I used to transport the batteries for my flashes. I have been using those cases for several years, and while I like them quite a bit, there are a few drawbacks that made me wish for a better solution. Secondly, the nylon cases are opaque. so I couldn’t tell which batteries were inside which case. I use different batteries for different applications. If I need a particular battery for a certain piece of equipment, I would have to dig through the cases to find the correct cells. I couldn’t even tell if there were any batteries in a chosen case. For my workflow, I keep charged cells in cases, and discharged cells in a pouch in my camera bag. If there is one of the nylon cases in my bag, I would have to pick it up and examine it to see if it contained any batteries. This didn’t keep my up at night, of course. but it was annoying. I knew there had to be a better way. And when I discovered the PowerPax Storacell containers, I found it. I confess, my first thought when I saw the Storacell system was that the batteries were too exposed. Water and/or dirt could contaminate the cells. Then I realized I would only use the Storacells in my camera bag. If I have water and dirt in my camera case I have more important things to worry about than batteries. Once I got past that concern, I immediately realized these cases were just what I was looking for. Although PowerPax makes different sizes and configurations, the twelve cell carrier is perfect for my needs. It stores twelve AA batteries together in one place. It is large enough that it won’t get lost in the bottom of my camera bag, yet small enough that it can be squirreled away so it doesn’t take up too much space. 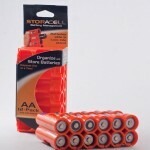 More importantly, I can see all the batteries inside the Storacell. If I need a particular cell, I can find it quickly. 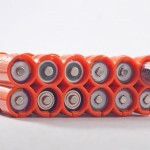 The cells can be inserted with the positive terminal up or down, and some people like to store charged batteries with the terminals pointing in one direction and then insert discharged cells in the other direction. While that is nice feature, I prefer to keep fully charged cells in the Storacell and then put all the discharged cells into a pouch for charging later. In that way, jut a glance at the Storacell tells me how many charged batteries I have available, I don’t have to take extra time to count which terminals are pointing up or down. Since I like to charge and use my flash batteries together in sets of 4, I use a Sharpie marker to label the cells from a particular set. That way, i can dump all the discharged cells together in a pouch, then charge them together as a set. The fully charged cells can then be placed into the Storacell for the next shoot. Testing NiMH batteries isn’t easy, because the cells usually test good until they are nearly expired. So using a meter to test the voltage of NiHM cell isn’t very helpful. 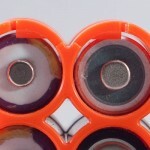 Still the design of the Storacell allows users to use probes on the cells without removing the batteries. As for removal, you can slide the individual cells up with a push of a finger. So you can “dispense” the batteries you need one-handed. Although it is easy to remove the cells, they appear to stay put in transport. I tried vigorous shaking of the Storacell caddies and could not dislodge the batteries. PowerPax offers the Storacell in a variety of colors. I opted for orange, because I thought that would be easiest to spot inside my camera bag. And they are “Sony Alpha Orange” to boot! The carriers are also available in yellow, black, clear and curiously, military green. I’m not sure about the last one. The camouflage would only work if your batteries are also painted in a camouflage colors. There may ne applications where you need to hide your battery supply, but as I have said, I want my cases as visible as possible to I can find them quickly. To that end, PowerPax also offers the cases in Moonshine. These cases are made of the stuff that glows in the dark after it has been exposed to bright light for a while. I used to do a considerable amount of night photography, and I think Moonshine would be perfect for this application. I may order some Moonshine cases for my next night-time photoshoot. I have 2 12-cell AA Storacell carriers. PowerPax also makes a 4-cell AA carrier, as well as a six cell AAA version. If you use CR123, they also feature designs to carry these around as well. I really like these carriers. The orange 12 pack caddies I am using cost just under $7.00 each. That price is slightly higher than the old nylon cases I have been using, but I think the obvious advantages make them well worth the extra cost. One more thing. The Storacell cases are made in the USA. Great organization, easy to find in your camera bag and they are made in America. What more could you want? You can find the Powerpax Storacell caddies on Amazon. Adorama also carries a selection of Storacell cases. 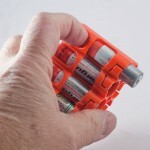 Powerpax claims you can “dispense” batteries with one hand. This entry was posted in equipment, review and tagged battery, battery storage, camera bag, organization, Photography, PowerPax Storacell. Bookmark the permalink. Post a comment or leave a trackback: Trackback URL.